Seeing this team without Martin Brodeur between the pipes has been hard enough to get used to. Now, for the first time in 28 years, we also have to get used to the idea of Lou Lamoriello not being the GM of this team. He's in Toronto now - for reasons that make no sense at all - and a new era begins under Ray Shero. I would not want to trade places with Shero right now. This is a team in the midst - or, more accurately, at the beginning - of a serious rebuild. 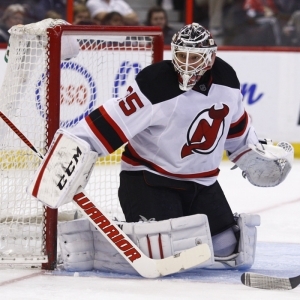 Cory Schneider is a legitimate goaltender, but much of the rest of the roster - Mike Cammalleri, Travis Zajac, Andy Greene, Travis Zajac, Patrik Elias, Adam Henrique, Tuomo Ruutu - are overpaid and uninspiring. It is going to be a very long year in New Jersey. There are glimmers of hope for the future. Pavel Zacha was a nice draft choice this year and has the chance to be a No. 1 center down the road. The defense has a promising future - guys like Adam Larsson, Damon Severson, Eric Gelinas, John Moore and John Merrill are all under 24, and all could turn into strong players. Severson in particular looks to have a bright future if he can recover from the injury that impacted his rookie season last year. Defensive improvement doesn't happen in a hurry, though, so this is not a road to a fast recovery. The defensive strength does not address the biggest issue, either. This team was just 28th in scoring last year, and only Cammalleri managed to score 20 goals. Only the power play was noteworthy, and that is likely to change, too. Adam Oates was responsible for the performance there, but after being the interim co-head coach last year he is gone, and John Hynes is the new head man. The hiring of Hynes as head man is a good starting point. He is just 40 and is making his NHL debut in any capacity - he has never played or coached in the league. He has spent the last five years coaching the Wilkes-Barre/Scranton Penguins in the AHL - with Shero as his boss for much of that time. He can coach, but it's inevitably going to be a rocky road. Beyond the head coach, Shero did not make ground-shaking moves. Kyle Palmieri comes from Anaheim and will be a top six forward - but not an inspiring one. Jiri Tlusty is a depth forward, and they would be better off in a lot of ways if he didn't make the team - more room for guys with upside to get playing time. Defensively, John Moore and David Schlemko were added and could be the third pairing out of the gate. Again, the faster they are replaced by the young guys in the pipeline the better. Schlemko, though, is a useful addition in the short term - he filled a strong role in Calgary as a waiver claim last year when injuries made him important down the stretch and through two rounds of the playoffs. Best-case scenario this team finishes somewhere around .500 and doesn't even come close to the playoffs. That would be bad news - it's hard to rebuild when you are drafting in the middle of the rounds. This is one of those cases where the best thing that could happen to this team is for them to be terrible. Really terrible. Auston Matthews, the likely top pick in the draft next year, isn't Connor McDavid, but he has the potential to be special. Being able to draft him would make this rebuild much faster. The Devils have a schedule soft enough out of the gate that they could easily be 3-3 if they were at all decent. This will be a good measuring stick of just what we can expect from them. Needless to say, I don't expect this to go well for them. The good news is that they aren't the worst team in the league in the eyes of the oddsmakers - at +10000 to win the Stanley Cup they are ahead of both Carolina and Arizona. Their chances of winning the Eastern Conference, set at +4000, are tied with Philadelphia and are deemed better than Buffalo, Carolina and Toronto. They are +1400 to win the very tough Metropolitan Division - better than only Carolina. Big prices, but not a stitch of value to be found. It's going to be a bleak year. This is a totally irrelevant team that can focus only on the future at the expense of any success this year. This will not be a fun team to watch.